At Resolute, we understand that sustainability and profitability drive our future. We balance the three pillars of sustainability – environmental, social and economic – to become not only a more efficient and competitive company, but a better employer, a stronger partner for our customers, and a deeply engaged presence in the communities where we live and work. In 2011, we established a set of ambitious commitments reflecting our approach to balancing the company’s sustainability priorities. While this entry focuses on Resolute’s climate change related activities and achievements, a full summary of our sustainability performance is available online. While Resolute has been tracking and monitoring GHG emissions from our pulp and paper mills since before 2000, we became a member of the elite World Wildlife Fund®’s Climate Savers program in 2011. As a member of this unique program, we established ambitious targets including a commitment to achieving a reduction in absolute GHG emissions of 65% below 2000 levels by 2015. This industry-leading GHG reduction target was surpassed two years ahead of schedule and we are still benefiting from our efforts. In 2015, Resolute achieved a 71% reduction in absolute scope 1 and 2 GHG emissions from our pulp and paper operations over a year-2000 baseline. Over 50% of this reduction came from reductions in energy consumption, fuel mix improvements and fuel switching, including efforts to switch from coal and heavy oil powered boilers to lower carbon fuels, such as natural gas and carbon neutral biomass. We also completed our first full year of 100% (scope 1) coal-free operations and began reporting all relevant scope 3 emission categories to the Carbon Disclosure Project, earning a disclosure score of 95/100. Through Resolute’s ambitious climate mitigation goal setting, our carbon reduction achievements exceeded our expectations and surpassed the expected results. Our 2015 efforts also included the sourcing of 72% of our energy requirements from renewable sources and deriving 78% of our fuel energy usage from biomass. We were also encouraged through the program to develop and offer products with lower GHG footprints to help Resolute’s customers reduce their own GHG emissions, such as the Align™ brand of eco-efficient papers which grew from 4% to 21% of the company’s specialty paper sales in 2015. Another goal set as part of Resolute’s climate mitigation commitments was to begin reporting all relevant scope 3 emission categories to the Carbon Disclosure Project (CDP), which we successfully did for the first time in 2015, earning a disclosure score of 95/100. Resolute operates in an energy-intensive industry, and we have long recognized the importance of reducing our carbon footprint and transparently reporting on our GHG emissions. Our success stems from focusing on improving energy efficiency, investing in clean energy projects and replacing high-emission fuels like coal with less carbon-intensive fuels, which benefits both the environment and our bottom line. 2011-2013, the company saved $60 million as a result of improved energy efficiency. By placing Resolute ahead of potential regulations and positioning the company as a leader in GHG reductions, our efforts also positively impact market positioning and create long-term value for our shareholders and other stakeholders. 4. 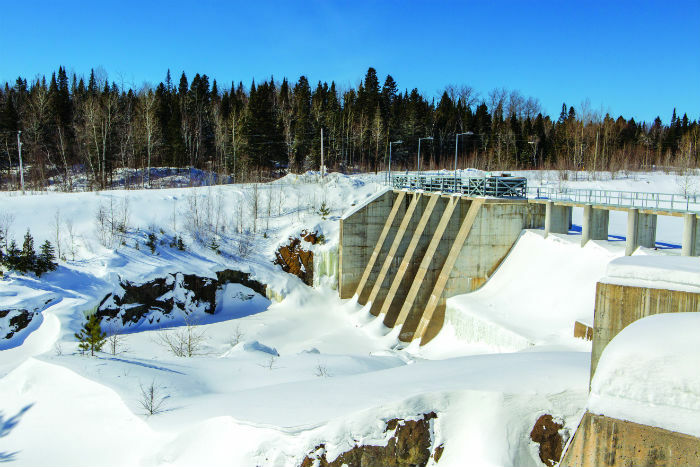 Our biomass pellet facility that produces 50,000 tonnes of pellets annually from residual sawdust used to supply Ontario Power Generation’s Atikokan station, now the largest power plant in North America fuelled entirely by biomass. Using wood pellets as opposed to coal will completely eliminate the Atikokan station’s emission of GHGs, a reduction of 67,000 MT CO2e per year. 5. 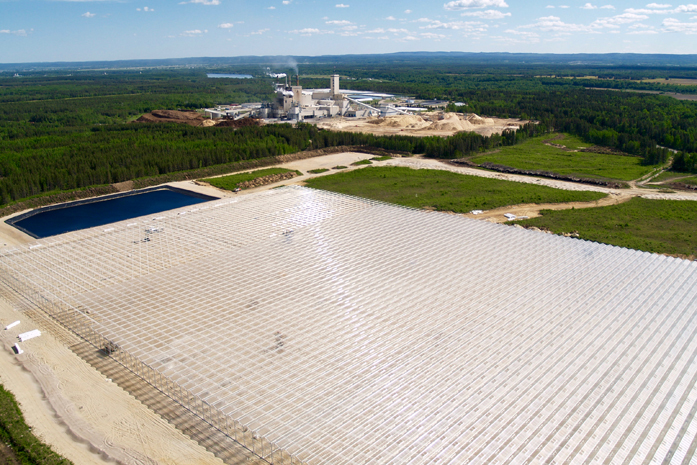 Resolute and Serres Toundra, the largest greenhouse complex in Quebec, have joined forces with CO2 Solutions to reduce carbon emissions at our Saint-Félicien pulp mill and reuse captured CO2 at the adjacent 34-hectare greenhouse. This first-of-its-kind initiative in our industry is not only good for the environment, but will also lead to significant economic and social benefits in the Lac-Saint-Jean region. Growing public concern about GHG emissions and their effect on the world’s climate is leading the public to ask for information on corporate GHG emissions. Actions to reduce GHG emissions and combat climate change are a key element of our sustainability agenda, like so many other companies in our industry. Resolute’s dual focus on reducing our carbon footprint by enhancing the energy efficiency of our facilities and increasing the use of lower carbon fuels provides an excellent example for companies hoping to replicate our results. Our company made a bold statement to its employees, business partners and the market when it joined the WWF Climate Savers effort and set a 65% GHG reduction target. We’ve surpassed this goal and raised the bar for our performance standard, continuing to make Resolute a cleaner and more efficient company, and one that is focused on a balanced approach to environmental, social and economic imperatives. The forest products industry, motivated by what we’ve shown can be achieved, could set similarly ambitious objectives and have similarly impressive results. In the past several years, Resolute has received 24 regional, North American and global awards and distinctions in recognition of our achievements in business, safety and sustainability, including Canada’s prestigious Clean50, the Northern Ontario Business “Judges’ Choice” Award for our wood pellet plant mentioned above, and The New Economy’s Clean Tech global award for Best Forestry and Paper Solutions for 2014 and in 2016. Both internally and externally, Resolute is now viewed as a true global leader in sustainability. Our success in reducing our carbon footprint has helped facilitate a cultural shift from reactive to proactive planning and preparation. It has encouraged company decision-makers, as well as employees, to move away from short-term issues towards integrating longer-term consequences and potential costs into our decision making and planning processes. This change has also encouraged Resolute to work closely with others in our industry to support global emissions reduction efforts. As a member of the Forest Products Association of Canada (FPAC), for example, we are a proud supporter of FPAC’s 30 by 30 initiative, which commits the Canadian forest products industry to removing 30 megatonnes of CO2 per year by 2030 – more than 13% of the Canadian government’s total emissions reduction target. Resolute also practices active forest management that can help forests adapt to climate change and maximize carbon sinks, in addition to supporting research on tall wood buildings that store carbon while avoiding the emissions associated with construction materials that require significant fossil fuel energy to produce.